Goldfish growth rates depend entirely on the conditions the goldfish are kept in, and the amount and quality of food you feed them. I was recently asked how old a one inch goldfish was. Apart from not specifying what variety the goldfish was, or if the measurement referred to total length or body length, it would still be nearly impossible to tell the age of the goldfish unless you actually saw the fish. Even then it would still be very difficult. If the goldfish had been kept in the optimum growing conditions, and it was a single tailed variety, it could have been 1 month old. If the fish had been kept in a small bowl and fed dried foods, it could have been 3 years old. Any one of the above factors can dramatically affect the growth rate. Partial water changes are critical for young goldfish. They are eating all the food you can provide, and producing large amounts of waste. Goldfish fry growth rates will be severely affected by polluted water. If you don't install some system of filtration and aeration, then you need to allow 24 square inches of surface area for each inch of fish. Filtration systems have the duel benefit of keeping the water clean as well as increasing the amount of water exposed to the air. You still need to make those regular partial water changes. Water temperature has a huge influence on goldfish growth rates. A 5oC increase can double the growth rate over a 30 day period. When goldfish are small, they can be fed almost continuously. They eat until they are full, process what they have eaten over an hour or so, then start eating again. It is much safer to feed live food during their early development because it won't quickly spoil in the warmer temperatures fry need to be kept in. This is one of the more critical factors that affect goldfish growth rates. If they get some ailment due to polluted water, or catch flukes from their parents, they stop growing. Even if cured, they never catch up the lost time it takes to cure them. They also never seem to thrive as well as fry that never got sick during their early growth stages. Because so many factors affect how fast a goldfish grows, anyone buying a fish under 50mm or two inches in body length out of the breeding season can only guess what the age of the fish is. Experience does help, but the buyer should only purchase fish that are displaying excellent health. 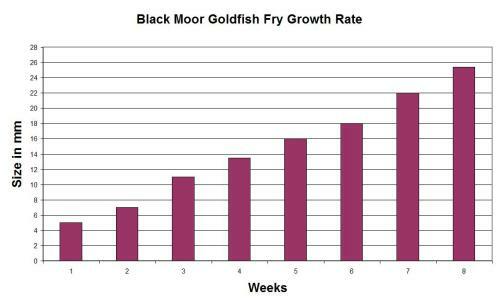 For more on goldfish growth rates I've created a page that has some graphs that show how fast Black Moor fry should grow in their first 8 weeks, and another showing an average growth rate over 12 months for fish kept outdoors all year round.